Any of our friends who have visited Rode Trip will recognize this phrase from the wall hanging on our bulkhead; it is a phrase we like to put into action. 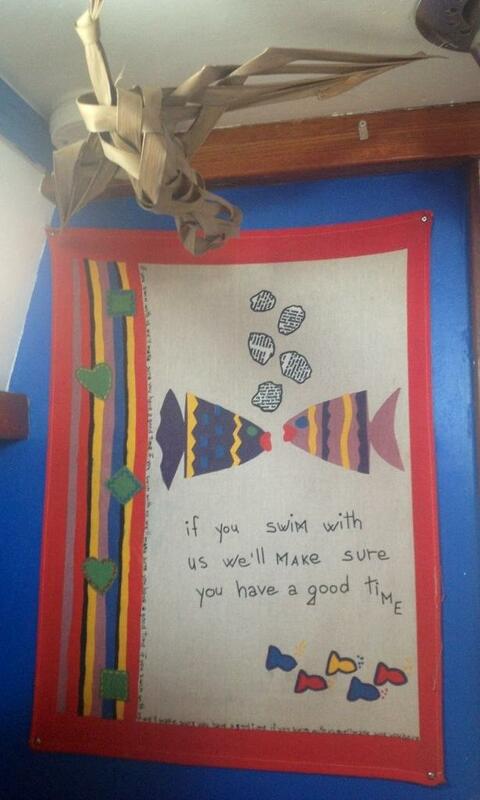 If you swim with us, we’ll make sure you have a good time! During Brian and Jennifer’s visit aboard Rode Trip we not only had a good time but we also had a unique swimming partner. One of the neighborhood dolphins frolicked near Rode Trip while anchored at Sand Dollar Beach, Stocking Island. Brian, Brian, and Jennifer all jumped into the water for this amazing opportunity to swim with the dolphin. The dolphin also came to swim while Mark and Ali were visiting and again we all jumped in to play. Here is a glimpse…the dolphin was quite friendly, swimming only an arms length away. Awesome! It never gets old seeing dolphins, much less having them swim with you, does it? Bill, dolphins always provide a fabulous show! Just checked out your site – best of luck with the projects, can’t wait to see you on the water!